"Music therapy is the clinical and evidence-based use of music to accomplish individualized goals within a therapeutic relationship by a credentialed professional who has completed an approved music therapy program" (2008). Music therapy begins with a thorough assessment to identify the client's strengths and areas of need. After the assessment, the music therapist manages the role of music in the therapeutic process, the relationship between the client and the therapist, and the approaches and interventions tailored to meet the needs of the client. "Art therapy is a mental health profession that uses the creative process of art making to improve and enhance the physical, mental, and emotional wellbeing of individuals of all ages" (2008). "The psychotherapeutic use of movement to further the emotional, cognitive, physical, and social integration of the individual" (2008). "Drama therapy is the intentional use of drama and/or theater processes to achieve therapeutic goals" (2010). Drama therapists may incorporate improvision, theater games, enactment, and storytelling, depending on the client's needs, interests, and abilities. Drama therapy is practiced in schools, hospitals, private practice facilities, nursing homes, and shelters, among others. According to the NADT, "Drama therapy is active and experiential. This approach can provide the context for participants to tell their stories, set goals and solve problems, express feelings, or achieve catharsis." Creative arts therapies share a commitment to the "expressive action that engages emotions in a direct and physical way; an ability to generate creative energy as a healing force for mind, body, and spirit; and a belief that the creative imagination can find its way through out most perplexing and complex problems and conflicts" (McNiff, 2005). The creative process in art therapy often contributes to a sense of clarity for the individual, leading to greater self awareness and understanding. Therapeutic art often brings emotional expression, improvement of self-esteem, and management of conflict. Art therapy is particularly useful in addressing trauma, because of the unique capacity of art to express repressed traumatic imagery. The art therapist is trained to use appropriate materials and directives based on the needs of the clients and is a facilitator of the client's journey towards self-awareness and discovery. Music therapy: There is a wide array of research-based evidence to support the use of music therapy. Much of this research is published in the Journal of Music Therapy, which is available through the American Music Therapy Association (AMTA). AMTA also publishes Music Therapy Perspective, which includes articles on more clinical applications of music therapy in a variety of settings and clinical arenas. Music therapy research also appears in a variety of healthcare-related journals. If you are looking for research on a specific need or client population, visit the AMTA website at www.musictherapy.org. Art therapy: The American Art Therapy Association (AATA) publishes the Journal of the American Art Therapy Association, which is the leading publication for this field. This journal presents articles with diverse perspectives on art therapy, as well as topics related to professional practice and research. Visit the AATA website at www.arttherapy.org to see a listing of the articles included in the latest publication. Dance therapy: The American Dance Therapy Association (ADTA) includes a number of research resources and bibliographies on their website. The association includes extensive bibliographies on the use of dance and movement therapy with a wide variety of clinical environments and client populations. Many of these articles are published in the American Journal of Dance Therapy, which include quantitative and qualitative research. ADTA lists several articles focused on the use of dance therapy in the treatment of clients with eating disorders and in the field of corrections. Additionally, research surrounding the creative arts can be found in journals such as The Arts in Psychotherapy or Alternative Therapies in Health and Medicine, as well as a variety of related professional journals. To find specific research for a particular need or creative arts modality, visit the appropriate website. It can also be helpful to speak with a therapist certified in that particular modality to direct you to the appropriate research. How do I find a music, art, or dance therapist? The American Music Therapy Association (AMTA) strives to connect individuals seeking music therapy services in their area (throughout the United States) to a qualified music therapist. Individuals and organizations can contact AMTA at (301) 589-3300 to speak with a representative who can connect you with a music therapist in your area. To locate a registered art therapist (ATR) in your area, contact the American Art Therapy Association at (888) 290-0878 or info@arttherapy.org. For additional information on how to locate a dance/movement therapist (ADTR), contact the American Dance Therapy Association at (410) 997-4040 or info@adta.org. Finding a qualified instructor or group to practice your expressive therapy is vital; check websites of professional organizations for music, dance and art therapy. Also, check with a qualified health practitioner about your fitness level before beginning any strenuous dance regime. For additional information about music therapy, visit the Center for Spirituality & Healing's online learning resources, then click Music Therapy. Bittman, B., Berk, L., Felten, D., Westengard, J., Simonton, O., Pappas, J., & Ninehouser, M., (2001). Composite effects of group drumming music therapy on modulation of neuroendocrine-immune parameters in normal subjects. Alternative Therapies in Health and Medicine, 7(1), 38-47. Boldt, S. (1996). The effects of music therapy on motivation, psychological well-being, physical comfort, and exercise endurance of bone marrow transplant patients. Journal of Music Therapy, 33, 164-188. Cardigan, M.E., Caruso, N.A., Halderman, S. M., McNamara, M.E., Noyes, D.A., Spadafora, M.A., Carroll, D.L. (2001). The effect of music on cardiac patients on bed rest. Progress in Cardiovascular Nursing, 16(1), 5-13. Cai, G., Qiao, Y., Li, P., Lu L. (2001). 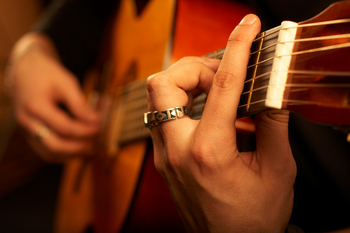 Music therapy in treatment of cancer patients. Chinese Mental Health Journal, 15(3), 179-181. Harper, E. I.(2001). Reducing treatment related anxiety in cancer patients: Comparison of psychological interventions. Dissertation: Southern Methodist University, USA. Heiderscheit, A. (2008). Music Therapy, www.csh.umn.edu. Longfield, V. (1995). The effects of music therapy on pain and mood in hospice patients. Unpublished master's thesis: Saint Louis University, USA. Miluk-Kolasa, B., Matejek, M., Stupnicki, R. (1996). The effects of music listening on changes in selected physiolocial parameters in adult pre-surgical patients. Journal of Music Therapy, 33, 208-218. McNiff, S. (2005). In Expressive Therapies, Malchiodi, C. (Ed.). Guilford Press, New York, New York. Raglio, A., Oasi, O, Gianotti, M., Manzoni, V., Bolis, S., Ubezio, M. Gentile, S., Villani, D., & Stramba-Badiale, M. (2010). Effects of music therapy on psychological symptoms and heart rate variability in patients with dementia: A pilot study. Current Aging Science, 3(3), 242-246. Sabo, C. E. & Michael, S. R., (1996). The influence of personal message with music on anxiety and side effects associated with chemotherapy. Cancer Nursing, 19(4), 283-289. Standley, J. M. (1992). Clinical applications of music and chemotherapy: The effects on nausea and emesis. Music Therapy Perspectives, 10, 27-35. Standley. J.M. (2000). Music research in medical treatment. In D. Smith (Ed.) Effectiveness of Music Therapy Procedures: Documentation of Research and Clinical Practice. Silver Spring, Md. : American Music Therapy Association. Standley, J. & Swedeberg, O. (2011). NICU music therapy: Pos hoc analysis of an early intervention clinical program. Arts in Psychotherapy, 38(1) 36-40. Thaut, M. & Abiru, M. (2010). Rhythmic auditory stimulation in rehabilitation of movement disorders: A review of current research. Music Perception, 27(4), 263-269.